Beyoncé has signed three teens to her management company, Parkwood Entertainment. Although, there is yet to be a formal announcement of the signings, but the news was discovered via court docs. The superstar is asking a Manhattan judge to approve the five-year deals, a requirement because the girls are minors, The Post’s Julia Marsh reports. The first contract covers LA-based sisters Chloe Bailey, 17, and Halle Bailey, 15. Beyoncé’s manager came across a YouTube video of the duo belting out “Pretty Hurts,” a song from Beyoncé’s last album. The video has over 10 million views. 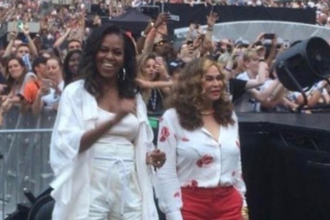 Their father, Douglas, gushes in court papers, “We cannot think of a better person to help guide the girls,” adding his daughters “worship” Bey. Their $1 million contract provides for up to six albums over five years. It awards Beyoncé 15 percent of the sisters’ gross earnings. Beyoncé also signed a third singer, 14-year-old Sophie Beem of New York, to her Parkwood Entertainment company. Beem inked a $560,000 deal after she wowed Parkwood executives. Beem finished in the top 40 contestants on “The X Factor” in 2012.